Mitsubishi Chemical Advanced Materials conferred the coveted international Mitsubishi Chemical Advanced Materials Award for the sixth time on Friday, January 30, 2015. Of the four prizewinners, the US researcher Dr. Peter DeMuth won the first prize of EUR 15 000. Dr. DeMuth wrote his thesis at Massachusetts Institute of Technology, USA. The other three Mitsubishi Chemical Advanced Materials Award winners, who have won prizes of EUR 5 000 each are (in alphabetical order): Dr. Darshil Upendra Shah (India) / University of Nottingham,UK; Dr. Jing Yan (China) / University of Illinois at Urbana-Champaign, USA and Dr. Rong Yang (China) / Massachusetts Institute of Technology, USA. Our warmest congratulations to the award-winners and thanks to all applicants for their entries. You will find more information on the Mitsubishi Chemical Advanced Materials Award 2015 and the assessments of academic jury in our press release. 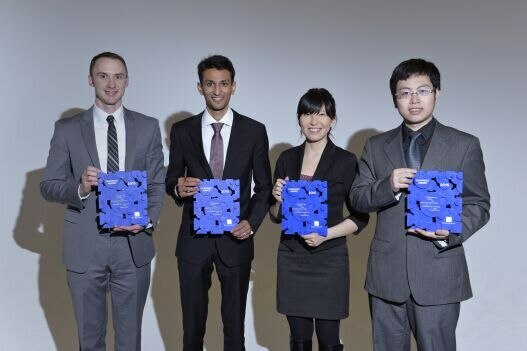 The winners of the 2015 Quadrant Award (left to right): Dr. Peter DeMuth (1st prize), Massachusetts Institute of Technology, USA; Dr. Darshil Upendra Shah, University of Nottingham, UK; Dr. Rong Yang, Massachusetts Institute of Technology, USA; Dr. Jing Yan, University of Illinois at Urbana-Champaign, USA.